You didn’t know you needed it, until now. While working on projects, I usually maintain a list in a Things project, and check them off as I’m done. But there’s always something I forget to add to that list, or check-off prematurely and then forget to fix later on. Turns out, some brilliant Australians — Jay Hollywood and Lee Karolczak — have been mulling over this exact problem. Launchlist is intended to help and encourage web designers and developers to check their work before exposing it to the world at large. The product was born out of frustration. For too long we had been using archaic methods to conduct pre-launch testing and the web was an obvious choice to do it better. Launchlist.net provides you with a ready-made checklist of the most important questions you need to check-off before launching a web product. Everything from that easy-to-forget 404 page, to assigning alt tags to images. Most important, everything is presented in drool invoking layout, cultured in the best of CSS, the choicest of fonts, and a subtle cloud animation in the background that’s almost too hard to notice. The service extends beyond just the checklist. 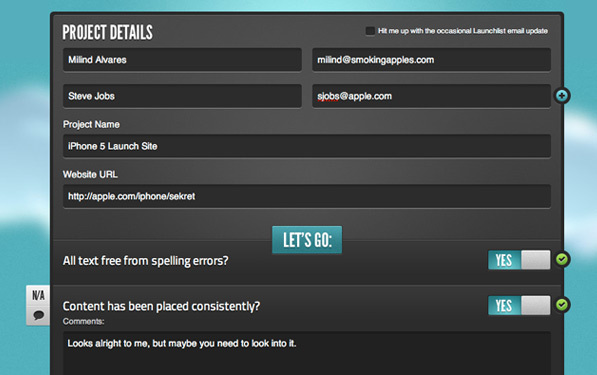 You can add comments to a checklist item, and it even has quick links to validate your CSS and HTML. Once you’re done checking, submit your report, and it will send your recipient an email with all of those details — a plain jane list, but it’ll do. The service is completely free (though they’re working on something more ‘pro’), so there’s no need for you not to check it out and launch your imaginary website.